With 30,000 people descending on Austin for SXSW Interactive, social reporting from the field can feel impossible. 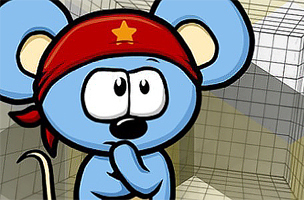 That's where RebelMouse comes in. Twitter, Instagram, Facebook, WordPress, LinkedIn — sometimes it’s just all too much to keep up with, especially when you’re reporting for your publication remotely and expected to keep social media followers in the loop. And with 30,000 people in the media and technology industries descending on Austin this weekend (March 7 to 11, more specifically) to recount the mass knowledge dump and hundreds of sessions that comprise SXSW Interactive, social reporting from the field can feel impossible. 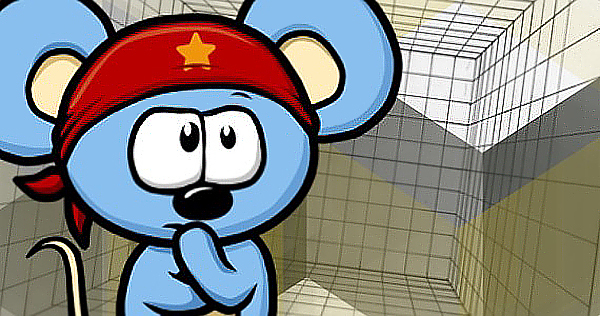 That’s where RebelMouse comes in. If you’re struggling to organize your digital presence and find it stressful to bounce back and forth across a dozen social media platforms, download the app ASAP. RebelMouse’s purpose is pretty simple. The iOS app allows you to manage all of your social media handles in one spot and in real time, while you’re on assignment. 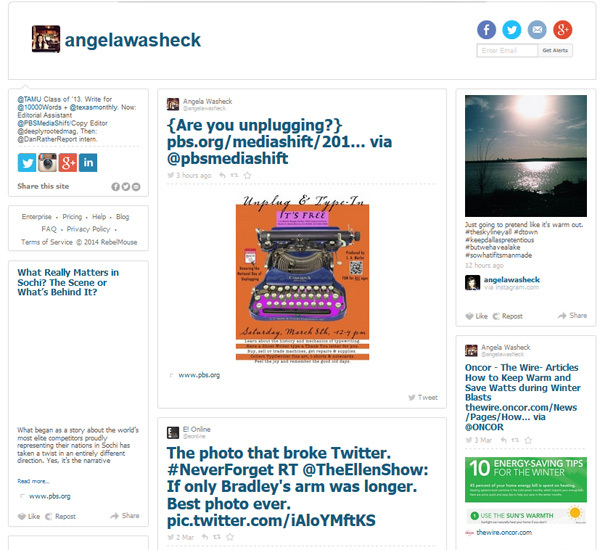 All of your feeds are updated from a pretty, personalized RebelMouse website. You can use the app’s free offering or pay more for features like enhanced branding and access to Google Analytics. While it was developed to help local businesses save time on posting social updates and serve as an alternative to building an expensive website, I’m convinced RebelMouse’s main function (aggregating) is the key to making the life of a reporter and publisher easier. Confession time: I’m a SXSW newbie this year and am covering the event for three separate publishers (Mediabistro among them). Between four days of back-to-back sessions, networking events and evening parties, it’s going to be nuts. But I plan on using RebelMouse to quickly find out what other publishers are covering, and where they might be presenting (already following the social media moves of Huffington Post, Mother Jones, TechCrunch, Longreads and more). The Pinterest-looking app will also help keep my own social handles straight. To see how other well-known publishers used RebelMouse at last year’s SXSW, check out Forbes’ coverage, Mashable’s take on the Interactive sessions and the Wall Street Journal’s social roundup. 1. Content Hubs: The PC Mag Get Organized hub, is powered by RebelMouse, an easy and effective way to showcase the conversation in real time. 2. Social Reactions: On the 50th anniversary of Martin Luther King’s “I Have a Dream” speech, NBC News asked politicians, celebrities and users to share their dreams with them using #DreamDay. Also, AOL showcased the best social media moments — from the top of the slopes to the streets of Sochi Village at the Winter Games — as seen from the eyes of the athletes. 3.Live Blogging: Al Jazeera America used RebelMouse to live blog about the possible U.S. intervention in Syria. 4. Live Events: About.com displayed their RebelMouse hub at their #GuideEvent13 event recently to collect reactions and highlights. 5. Talent/Columnist/Contributor Pages: NBC News created a beautiful hub for Ann Curry so that audiences can get a glimpse behind the scenes. To download RebelMouse from the App Store for free, click here. This post originally appeared on our sister site, 10,000 Words.